Mindfulness meditation originates from Buddhism and is the practice of being present and deliberately aware of our inner thoughts and surroundings. Mindfulness meditation has been showner to reduce stress, improve sleep, and improve cognitive functioning. Variations of mindfulness meditation include Mindfulness-Based Stress Reduction and Mindfulness-Based Cognitive Therapy. Mindfulness-Based Stress Reduction (MBSR) is an adaptation of the practice of mindfulness meditation to health contexts in order to alleviate stress, to foster awareness and relaxation, and to improve quality of life. Mindfulness-Based Cognitive Therapy classes are offered to address depression and anxiety. These classes combine traditional cognitive therapy techniques and mindfulness practices. U-M and the greater Ann Arbor community provide mindfulness resources, including traditional mindfulness meditation, MBSR, and Mindfulness-Based Cognitive Therapy, for free or for a fee. Wolverine Wellness offers mindfulness workshops for campus groups and offices. They can tailor a workshop to meet your specific needs and interests. To request a workshop, complete the online form at Request for Programs. Wellness Coaching is a free 1:1 service for undergrads and graduate students. 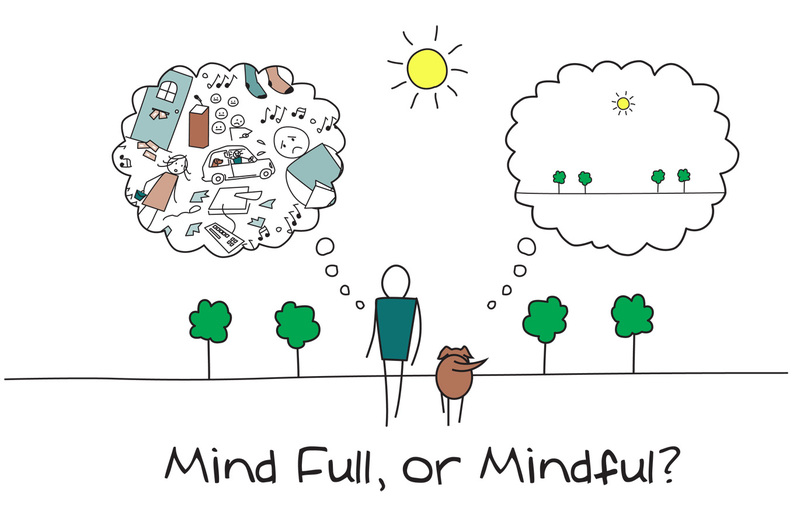 Learn more about how to incorporate mindful strategies into your life! Only have a minute? Incorporate mindfulness into your everyday routine using these One-Minute Stress Strategies. Counseling and Psychological Services (CAPS) offers several free mindfulness opportunities for students. See Groups, Lunch Series and Workshop Opportunities. Central Campus - For students, faculty and staff: Sessions are offered Mondays and Thursdays. noon-12:30pm, in G243 Angell Hall. All are welcome. North Campus - For students, faculty and staff: Sessions are offered Mondays, 12:15-12:45pm in EECS 1012. All are welcome. For students, the Mindfulness Meditation for Academic Success group is open to all students, not just those in LSA. Students, please sign up using the Google Form. For faculty and staff, please email Erin Trame at etrame@umich.edu to be added to the email reminder list. RecSports Group-X classes include Guided Meditation and yoga. Available to students and employees for a fee. MHealthy offers meditation classes for a fee for faculty, staff, students, and the public. Ann Arbor Open Meditation offers drop-in mindfulness meditation sessions, open to all. Sessions are appropriate for both beginning and experienced meditators. Ann Arbor Center for Mindfulness offers classes in Mindfulness-Based Stress Reduction for a fee. Transcendental Meditation offers a discount for full-time students to learn. Mindfulness-Based Cognitive Therapy: Search the Community Providers Database using "mindfulness" as a search term. Still Mountain Meditation: This new sangha offers weekly Sunday meditation sitting at U-M Turner Senior Resource Center (2401 Plymouth Rd. Suite C) at 10 am, open to everyone. It is walking distance from North Campus, so if any students who live there are looking for a place to sit on a regular basis, this is rather convenient.They also have Buddhist meditation classes for free, with donation. Michigan Buddhist provides locations of mindfulness sessions in Ann Arbor as well as resources on Buddhism. Insight Meditation Ann Arbor offers meditation classes for all levels, donation recommended. Deep Springs offers introductory meditation classes for a fee. The Zen Buddhist Temple offers meditation courses at all levels for a fee. JissoJi Zen Ann Arbor is a Zen meditation group in the tradition of Zen Mind, Beginner’s Mind. All are welcome, no experience necessary. You can try guided meditation with these recorded sessions. About the image on this page: We don't own the rights to this image, but it is available for free use, to our knowledge.